I've had my candy cane (Caulastrea) for 6 months. It opens, but never inflates all the way, and I'm trying to figure out why. The attached picture shows the maximum it will puff out. It opens during lights-on & closes after lights-off, puts out feeder tentacles (when open as well as when closed); when I feed it the heads close in a smooth, sphere-like shape which I presume means it's digesting (does this for mysis & Oyster Feast, but not Cyclopeeze). Since I've had it one head has split in two and another is in the process of splitting. In general it looks healthy. - Light. It's under a PAR 30 LED, but for the first 6 weeks was under 9w CF so it's been the same under high & low light. - Flow. It's in gentle flow, which I'm told is appropriate. every week using ESV B-ionic salt, so all the trace minerals, etc. get reset. I also dose w. a 2-part ionic supplement (C-Balance). pH = 8.2. Ammonia, Nitrite, Nitrate = 0. Phosphates = 0-0.1. - Pests. Have never seen anything on it. - Allelopathy. 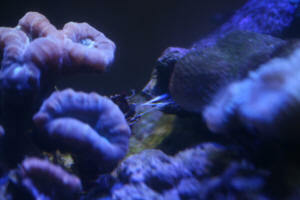 This was my sixth coral, the others being a ric, and small frags of Zoas, Palys and cloves. I've since gotten other corals, but it was already uninflated with the initial crew. - Space. I've been wondering if they have a way of sensing how much space is around the heads before inflating? While it does have room to inflate, it would be almost touching the tank wall and rock. Unfortunately, I don't have another place to move it that isn't higher light & flow than I think it wants. One week I accidently had it too close to the glass and a couple of heads smooshed when they opened, but they opened anyway. I know other reefers who have fully-inflated candy canes in the same 3 gallon tank as mine, and with 10 times the amount of livestock. I'm out of ideas. Would appreciate your thoughts, and let me say I've gotten tremendous value out of reading your site and thank you for sharing your expertise. Have a very new reef setup with no fish but only some inverts. It's been running for the last one month only. Have had a couple of pineapple brains for the last week and feeding it crushed/ground fresh cocktail shrimp twice a week. brown slime from each of its mouths. Attaching a photo of the same. Almost all the mouths did excrete this brownish slime over a half hour period. Then everything got cleaned out with the current and it's back to normal. The brain did shrivel back during and after the excretion (?). Is it OK or is my brain sick or something. 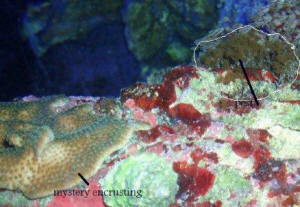 I have a Caulastrea (Candy Cane) where the skeleton is actually splitting down the middle. This happened over a period of three days. The original appearance was uniform, more like a ball. Wondered if you have ever witnessed anything like this. See attached pic. The Yellow Tail Damsel is not camera shy for sure, very nosy. Hi, I added a piece of rock with a mushroom on it to my aquarium about a week ago. 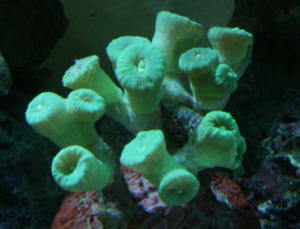 I placed the rock next to my candy cane corals, with the single tiny mushroom about 3 or 4 inches from the candy canes. You can barely see the mushroom on the end of the rock in the 2nd attached picture. Anyways, now there are these shiny fibers attached between the rock and a candy head that has been dead since I purchased the coral some months ago. not. My water quality is fine, with nitrites and ammonia at 0 ppm and nitrates just above 0. 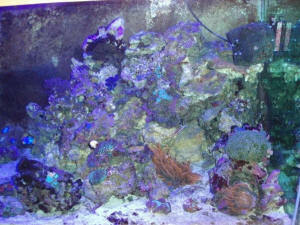 Calcium levels were somewhat high last time I checked, but all my corals I've put in so far seem to be doing great. Salinity is at 1.024 and temperature is about 78. I see good polyp extension during the day and most of my candy canes have feeder tentacles coming out every night, so it doesn't seem like anything is being bothered just yet. I just added a chalice yesterday that also seems to be doing well. So I'm just hoping that these strange fibers aren't going to start killing off my corals. Any help would be greatly appreciated as I am completely stumped on this one. Thanks. The threads aren't coming from any living coral tissue though. Is the coral somehow producing these through the dead skeleton? 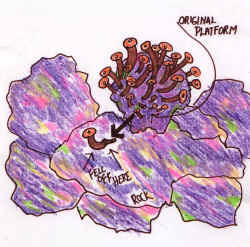 Also, does this mean that the coral might grow a new head or something in that direction if it seems suitable? More information regarding what this "reaching out" process is all about would be very helpful. The link you sent me seems to talk mostly about coral competition through toxins or physical contact, but there wasn't really anything about corals detecting others around them through the use of such fibers. 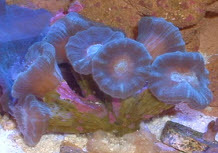 The article mentioned how to prevent competition and so forth, but my corals aren't harming each other at all. I am well aware of the devastating effects of sweeper tentacles and nematocysts, but the 2 corals are too far away for the regular nematocysts to have any effect, and I have never observed any sweeper tentacles coming from any of the corals in my tank, and these threads are clearly not sweeper tentacles. The threads also do not appear to be any sort of digestive fibers that corals sometimes use to consume neighbors, as they are not touching any other corals and are not coming from any living tissue. Their location suggests that the threads are coming from some other organism besides the corals, unless corals are able to produce these from skeletons that have been dead and without tissue for over 6 months. Either way, more information regarding the process of detection of other corals rather than how they kill each other would be appreciated. Interesting. Ok well thanks for the help. I guess I will wait and see what happens as you advised. Good to know that you think there is actually some live tissue there. Hopefully the coral continues to spread. Thanks a lot. 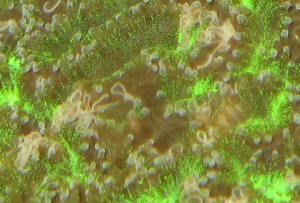 This is a picture of a Favia coral I received from a reefkeeping friend who had left it for an extended amount of time under poor lighting (T5 white fluorescents). He actually gave me 3 frags total, 2 appeared to be frags of the same original organism. Both were lightly colored when I received them as you can see in the picture, but one frag recently (within the past couple days) developed this weirdness. red but I have no picture of their original organism and this looks rather odd to begin with. Apologies for the blurry photograph, it was taken with a cell phone as my regular camera batteries are charging. I did some perusing of the WWM faqs on bleaching and diseases on Faviids and I didn't see anything that looked like this. but I'd thought any bleaching as a result of light changes would have taken place sooner. Could you explain your thought on this? I'm fairly new to the hobby and I don't really follow. Also, I've been feeding phyto and mysis shrimp in the tank on recommendation from the friend and WWM faqs. 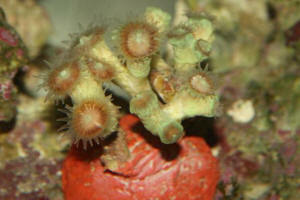 Question on Mushroom Coral and Candy Cane Coral... a Fungia, not a Corallimorph 11/21/07 Hi, <Hi Sammy!> I have this mushroom coral for 2 weeks now. <You have a Fungia, occasionally called a mushroom coral, not a Corallimorph, which is more typically called a mushroom coral. More here: http://www.wetwebmedia.com/fungiidae.htm > It seems to bloom only when the lights are totally off. <Yes, this is not atypical.> Here are photos of it with the light on, with only a flashlight, and lights totally out. <I see.> I currently have it half way down the water column with medium water flow. 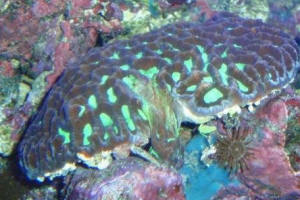 Should I move it down onto the sand <Yes, but be aware, these corals ARE MOBILE. Yes, that right, they are capable of moving, even capable of climbing! And their mucus can be quite toxic. 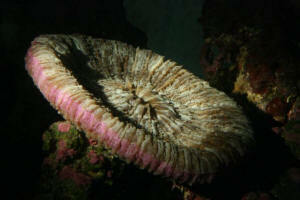 So the Fungia need to be kept at a distance from other corals.> or in a shadow from the light? <In the light is fine.> Is this normal? <Yes.> I also have a candy cane that is doing the same thing. <This is normal. More here: http://www.wetwebmedia.com/faviidae.htm > When I bought this coral, it was quite bleached. It is not starting to get some green coloring. 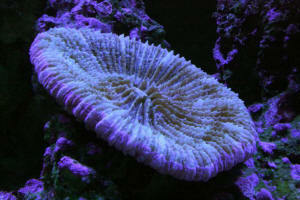 <Good.> I have seen candy cane corals opening in full light at the LFS. <Yes, some gradually accommodate.> But mine will only open when the lights are off. <Again, not unusual.> Is this related to that fact that it was bleached? <Not necessarily.> What is the best thing I can do for this coral? <Feed it at night when it is open, finely minced pieces of meaty foods.> Move it to a very low light location? <No.> Here are photos of the candy cane. <I see.> Flash shot with lights off. <Came out pretty well for just being illuminated with a flash light!> Thanks for your help.